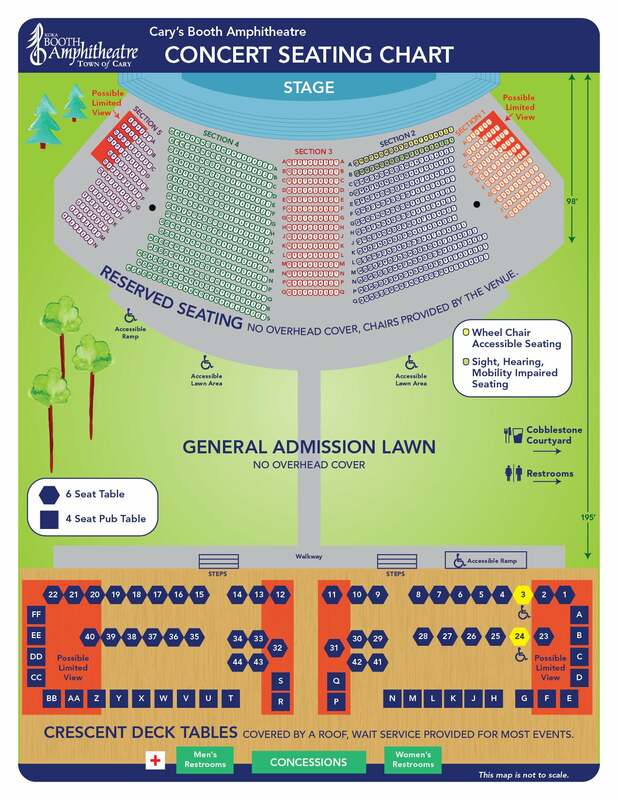 General admission Lawn seating starts behind the reserved seats and ends at the Crescent Deck in the back of the venue where the reserved table seats are located. You may bring your own chair (any height). Low Beach chairs may be rented for $5.00 cash at Guest services. For every chair rented we will donate 20% back to The Town of Cary’s Play it Forward - Scholarship Fund. Proceeds go towards the fund, which provides scholarships for Parks, Recreation, & Cultural Resources' programs. Reserved Table seats are covered by a roof and are located behind the lawn seats. Numbered tables are 6 seat tables (1-44), 4 seat tables are lettered (A-FF) and are higher pub tables. * All dates, times, acts & prices are subject to change without notice. A small fee will be added to the prices when paying by credit or debit card. Cardholder must be present with a valid photo ID when paying at the venue Box Office with a credit or debit card. Tickets for Booth Amphitheatre events are subject to applicable taxes and fees. Unless otherwise stated, posted prices include a 7.25% NC Sales & Use tax. Rain coats and ponchos are allowed for all events. Umbrellas are not allowed for most events. Please check the Items Allowed/Prohibited on the specific event page you are attending to see if umbrellas are allowed. In the event of severe weather conditions (thunder/lightning, etc.) announcements will be made from the stage concerning the status of the event due to weather conditions. We ask all patrons to remain calm and listen for these announcements. Information will be posted on the Amphitheatre Facebook and Twitter pages, at www.boothamphitheatre.com or call our weather Hotline at 919-459-8332 for updates before & during the event. In the event of a weather delay please listen for the air horn in the parking lot as signal it is safe to re-enter the venue. Please keep your ticket & have it ready when re-entering the gate. Venue policy is no refunds or exchanges in the event of rain. GENERAL PARKING: Parking is free of charge in Amphitheatre owned lots. Some local businesses may charge a fee to parking in their lots. PREFERRED PARKING: A limited number of PREFERRED parking space are available for $10.00 per car in advance or $15.00 on the day of event (cash only). ACCESSIBLE PARKING: A limited number of accessible parking space are available on a first come first served basis with the proper hang tag or license plate. PICK UP & DROP OFF: If using a taxi, Uber etc please follow the signs & our Parking Staff to the pick up & drop off area. All bags, back packs, purses are subject to search. Venue concession stands will be open serving a variety of fantastic food and beverages. Food trucks are located on the Lake path. Food trucks scheduled will be posted on our website 48 hours before the event. Why not Picnic in the Park? Let us pack your picnic! Pre-order dinner and pick it up when you arrive! Orders must be place at least 24 hours prior to the date of the event. Our Virtual Café offers a variety of food items from appetizers to desserts. Your order will be waiting for you when you arrive on-site at the Amphitheatre! Booth Amphitheatre Picnic in the Park catering partners include Taziki’s Mediterranean Cafe, Lowes Foods, Great Harvest Bread Co. and Kale Me Crazy. Children 2 & under are free on the lawn for this event.Tickets are required for Children 2 and under for the reserved seating areas when applicable even if they will sit on an adult lap. Re-Entry is not allowed for this event. Leaving the amphitheatre and re-entering is only permitted in weather related or medical emergencies. If you have a request for re-entry, contact an event staff supervisor at the gate prior to leaving. 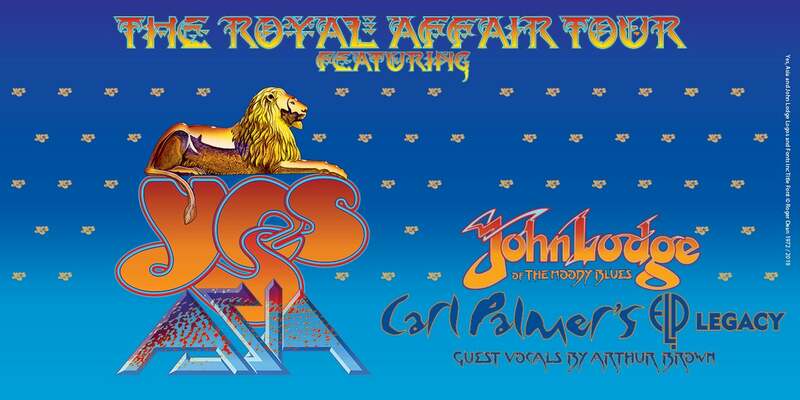 The first set of dates for “The Royal Affair Tour” has been announced. The show will play Cary’s Booth Amphitheatre on July 10. Tickets go on sale Friday, April 5 at 10 a.m. YES is Steve Howe (guitar – joined 1970), Alan White (drums since 1972), Geoff Downes (keyboards; first joined in 1980), Jon Davison (vocals since 2011) and Billy Sherwood (guitar/keyboards in the 1990s and the late Chris Squire’s choice to take over bass/vocals in 2015), with Jay Schellen on additional drums. 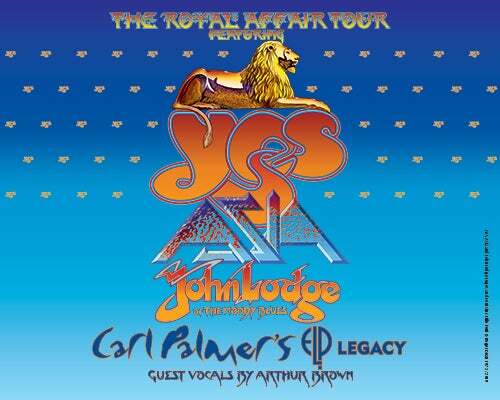 Look for YES to perform songs from throughout their storied career, one of rock music’s most prized bodies of work, and their set will honor the memory of YES members Chris Squire and Peter Banks. Asia will play their signature songs and pay tribute to their late founding member John Wetton. 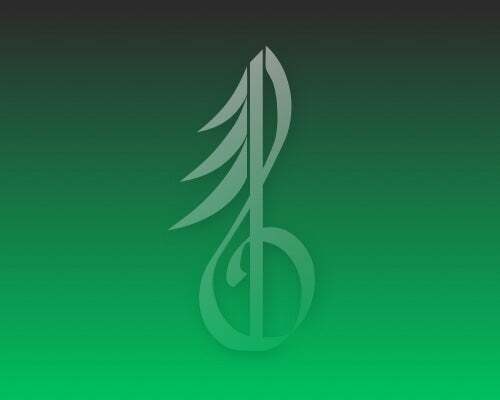 A portion of their set will feature original guitarist Steve Howe in a special performance. Asia will also introduce its new line-up featuring guitarist/lead vocalist Ron "Bumblefoot" Thal and bassist Billy Sherwood. John Lodge’s set will encompass his classic hits by Rock & Roll Hall of Fame inductees The Moody Blues and pay tribute to the band’s recently departed member Ray Thomas. Carl Palmer will honor the memory of his fellow Emerson, Lake and Palmer members Keith Emerson and Greg Lake, with vocals by British vocalist Arthur Brown.